A colophon records that this Bible was written in 1254 by William of Hales (perhaps from Hailes, in Gloucestershire?) for Thomas de la Wile, who had been called by the chancellor of Salisbury to be in charge of the Salisbury schools. 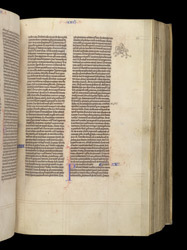 The text was copied from a 12th-century Bible still in Salisbury cathedral library. In the mid 13th century the city was an important centre of scholarship, and a number of fine illuminated manuscripts (probably produced there) can be attributed to the artist of the present manuscript, the so-called 'Sarum Master'. Marginal illustrations, which were to become popular in the 14t and 15th centuries, are very uncommon at this early date. This image is also very unusual both because it is uncoloured, and because it is a direct illustration of the adjacent text (Judges 14:5-6), in which Samson kills a lion with his bare hands.